This muddy looking bunch of vegetables just arrived from my Mom's root cellar. Yes, people still have those sorts of things... root cellars. To store roots. Like these! I realize these look like.. well, like dirt. But they are actually hiding some beautiful vegetable colors! *Ahem! 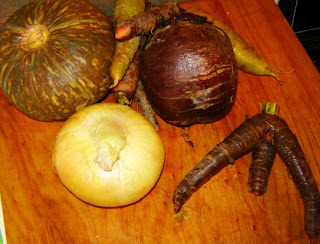 * Should you be wondering what in the world some of these nondescript, dirt-covered things are, pictured are: beets, yellow carrots (which are really sorta pale green), a small kabocha squash, Walla Walla sweet onion and an... um.. three-legged purple carrot. 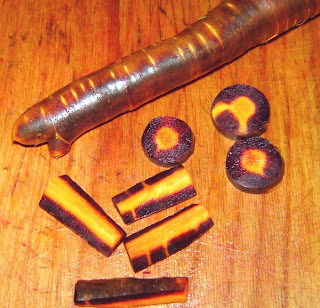 Seriously though - Check out the purple carrots when cut up, the brilliant purple color goes about half-way through, it looks SO cool! So tomorrow for Thanksgiving's non-turkey dinner I'm doing roasted root veggies. They looked so pretty all cut up in my roasting pan I just had to get a picture. 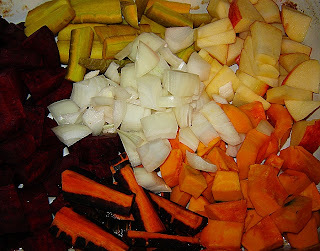 Apples, squash, yams, three kinds of carrots, beets and onion. Tomorrow I'll drizzle with olive oil and a little cider and roast until tender. Yum! The kitchen's still full of half-finished baking and cooking projects. I'll post more after the big day! I'll close with this final picture and a super-easy recipe. Not much to look at, but it's my most favorite soup in the world. 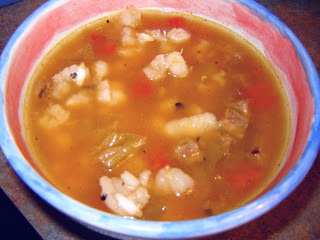 New Mexico's own Fire-Roasted Green chile stew made with Hatch chiles. But I digress. OK, so I added little dumplings because my kids like those. Maybe not so traditional but still quick and easy, warm, spicy comfort food. 1/2 cup tvp - I use medium chunks - that has been rehydrated in 1 cup boiling water. OR you could use 1 can drained, rinsed pinto beans. Boil potatoes until almost tender - if using them. I often don't, just because it's quicker to make this without, but they are nice in the soup too. Sautee onion in Earth Balance until soft and translucent. Add garlic and allow to brown slightly. Stir in roasted chiles. Sprinkle flour over onion mixture, stir in and let brown slightly. Stir in salt, stock, oregano and potatoes. Reduce heat to simmer. Stir in drained tvp or pinto beans. Pour stew into buttered casserole dish and top with small teaspoon-size dumplings made with biscuit mix or your favorite recipe. Bake at 450 for 20 minutes or until dumplings are firm and exposed bits are golden brown. Serves 6 if you're lucky. HAPPY AMERICAN THANKSGIVING to all my US friends. HAPPY REGULAR OLD THURSDAY to everyone else. Happy Thanksgiving! Wow, I cannot imagine how good those root veggies are going to taste. that carrot is beautiful! and you soup looks delicious, too. Those veggies look beautiful! I hope they taste great and that you are having a fabulous Thanksgiving! Yum! I totally agree with the new mexico green chiles thing, that's a perk of living here.